North Korea is focusing more on diversified development of its economy and pushing regional industries to play a greater role in earning foreign capital, Pyongyang watchers said Sunday. Observers in Seoul said that the Oct. 31 issue of “economic research” published in the North highlighted the need for regional governments to generate more revenue, bolster industrial output and earn more foreign capital. According to papers in the research journal that offer a glimpse into how Pyongyang wants to run the country, factories in the provinces must strive to modernize and form close knit alliances with industries located in the capital city and with laboratories. This call is similar to a speech given by Vice Premier Ro Du-chol on Wednesday at a ceremony marking the 40th anniversary of regional governments being given authority to generate profits and manage their respective budgets. The senior official stressed that all cities and counties need to do their utmost to improve their economies and come up with necessary policy plans. Such a move calls for redoubled efforts to attract overseas investments in mineral mines and other manufacturing facilities. Ro’s remarks have been interpreted as Pyongyang paying more attention to regional economies and getting local authorities to take charge of providing for its citizens, instead of relying on the central government. Related to such calls, the North recently announced that it will set up a total of 14 special economic zones across the country to pursue economic growth and bring in more investments. At present the communist country only has four such special zones, including those set up in Kaesong and the Mount Kumgang resort. “There has been a trend coming into this year of the North paying closer attention to building up its regional economy,” said Cho Bong-hyun, an analyst at the IBK Economic Research Institute. The North Korean expert said that this may be a move by the North to bring about results on the economic front under the Kim Jong-un leadership. Kim, who took over running the country following the sudden death of his father in late 2011, has called for the simultaneous development of the country’s nuclear capability and its economy. This move is seen as a departure from the “songun,” or military-first politics, pursued by his late father, Kim Jong-il. North Korea appears to be pushing for internal economic improvement measures. Chosun Sinbo, the pro-North Korean newspaper in Japan, released an article on November 6 that discussed various performance-enhancing management and operational changes that took place at the Pyongyang Essential Foodstuff Factory this year. The main systemic changes made at the Pyongyang Essential Foodstuff Factory were the increase in autonomy of the company and the enforcement of wage differential based on performance. Based on the principle of cost compensation, prices of products produced with raw materials at the factory may be freely adjusted after consulting with the state. The news article further explained that “The principle of socialist distribution is a simple system of distributing as much as you earn and the cost of living is determined by labor productivity.” It also reported that some of the employees’ wages increased. Such news is likely intended to advertise to the outside world about North Korea’s changing domestic economic policies. The North Korean economic journal Kyongje Yongu has also been increasingly reporting on the principle of distribution based on economic performance. In the recent issue published on October 30, 2013 (issue No. 4), an article titled “The Principle Problem of Properly Implementing the Socialist Labor Wage System” criticized the equalization of product distribution as it decreases the enthusiasm of workers toward production: “The strength and life used during the process of labor must be compensated through the principle of earning the amount of your labor.” The article stressed that wages must increase with production and rationalized the need for such wage increase. Chosun Sinbo and Kyongje Yongu articles reveal the long-term efforts by the North Korean government in enhancing research about economic improvement measures and expanding projects in various factories, companies, and cooperative farms to implement these measures. Recently, North Korea launched the State Economic Development Commission and organized a number of international forums on special economic zones. These can be construed as possible signals toward economic reform, as North Korea continues to make various changes in its internal economic policies. Choson Sinbo, the regular publication of the pro-North Korea General Association of Korean Residents in Japan (Chongryon), has published news of a Pyongyang-based food factory being used as a testing ground for independent economic management. The enterprise fixes prices semi-independently in discussion with the state and pays increased wages, the piece, published yesterday, explained. “This factory has shed the state planning model and sources its own materials, and in discussion with the state it has been able to set its own prices as it sees fit. There is also a measure currently being adopted that provides monthly allowances in consideration of the labor of the employees,” it further emphasized. North Korea’s decision to drastically increase the wages of workers in parts of the heavy industrial sector is designed to boost morale and improve productivity, the better to expand the country’s capacity to generate foreign currency income from investments in the exploitation of its mineral resources. As exclusively reported yesterday by Daily NK, major industrial concerns in North Hamkyung Province such as Kim Chaek Iron and Steel Complex have raised wages by a factor of approximately one hundred, from a derisory 3,000 won per month, around half the market price of a kilo of rice, to 300,000 won. Thus far, 100,000 won of the total has been paid in cash and the remainder in kind in an attempt to head off the very real danger of dramatic price inflation that would result from 100% cash payments. That such a substantial wage rise was only deemed feasible in enterprises with the potential to export primary or secondary resources for foreign exchange should not come as a surprise. Smaller domestic enterprises don’t have the liquid resources to take such a step. As with the Kaesong Industrial Complex, wages in cash and kind have always been more generous for workers in joint venture enterprises than elsewhere. The latest move reflects an extension of that reality. At this early stage, experts believe that the measure is designed to create a business model for North Korea not unlike that on show at Kaesong, under which each province can improve its economic performance and attract greater quantities of foreign capital. By actively nurturing those rare businesses that are competitive in the regional environment, the country hopes to raise productivity overall. A researcher with Industrial Bank of Korea, Cho Bong Hyun told Daily NK, “Raising salaries for enterprises in the minerals sector looks like an inevitable choice, since productivity couldn’t have been expected from light industrial enterprises when the operational level of most of those factories is so low. However, despite cautious enthusiasm for the latest step, the two experts cautioned that unless North Korea moves further in the direction of a market economic system, the measure might not prove effective. Yoon added that workers in enterprises excluded from the latest wage rises will not see the bigger economic picture, and will simply be aggrieved at there being no improvement in their own conditions. “Conflict is unavoidable,” he concluded. Wage levels for workers in some larger industrial enterprises have risen by a factor of approximately one hundred times, Daily NK has learned. The move, which was put forward as part of the “June 28th Policy” in mid-2012 and is designed to bring wages more into line with market price levels, appears designed to improve the productivity and competitiveness of major industrial concerns. According to a source from North Hamkyung Province, the monthly wage of people working at Musan Iron Mine, Kim Chaek Iron and Steel Complex and Sungjin Steel Mill rose from an average of just 3000-4000 won up to 300,000 won in September and October. In an attempt to forestall the inflation that such a step would otherwise guarantee, 200,000 won of the payment is issued in goods, with just 100,000 won provided in cash. The source went on to assert that the same instructions have been handed down to all provinces, not only North Hamkyung. “Relatively more competitive” industrial enterprises in each province have been selected, he said, and are resetting wages at a higher level. Explaining the system of payments in kind, the source said, “Because they are concerned about the danger of inflation being created by the wage rises, they give 200,000 won of it in rice, vegetables, side dishes, other necessities, and electronics. Only the remaining 100,000 won is given in cash.” Workers have been told “not to make purchases in public markets since the state is now providing for your daily needs,” although the instruction is not likely to be adhered to. The move appears designed to increase the competitiveness of major industrial enterprises in North Korea, and to improve the attractiveness of joint ventures to companies in China. At the time of writing, the dramatic wage increase has not generated rice price inflation in public markets in the North Hamkyung Province region. For example, the price of rice in Musan is currently stable at around 5,800 won/kg. On this, the source concluded, “Because some of the wages have been given in kind, demand in markets will not rise for the time being.” However, he cautioned that later, when workers attempt to buy and sell the products they have received, instability and inflation could result. To shed light on the inner workings of policymaking in North Korea, this study examined the process behind economic policy change through an analysis of the official state economics journal (Journal of Economic Research 경제연구). Semantic networks are used to trace the introduction and evolution of policies during four distinct economic periods in North Korean history between 1986 and 2009. Although reform is catalyzed by political and economic crises, the emergence of new policy topics occurs incrementally prior to change. Specifically, new policy discourse tends to emerge in gradual and cautious ways but policy change occurs swiftly in periods of crisis. During periods of stability, the state retreats to the centralized socialist economic system, often through coercion and force. This view of the policy process suggests that foundations of economic reforms in North Korea are yet weak and instable, and policy reform will continue to be vulnerable to the political influence of conservatives. A North Korean economic quarterly has stressed the importance of commercials to help promote the country’s exports, which rely heavily on China. “We should promote our economic prowess abroad and decisively increase exports of products by taking advantage of commercials in foreign trade,” North Korean quarterly magazine, Economic Research, reported in its October edition, a copy of which was obtained by Yonhap News Agency. The publication, which mostly deals with the North’s economic policies, said exports should contribute to achieving the country’s stated goal of ushering in a prosperous nation by this year. The year 2012 has political significance to North Korea as it marks the centennial of the birth of the country’s founder Kim Il-sung, grandfather of current leader Kim Jong-un. The quarterly also called for high quality commercials to penetrate capitalist markets and increase exports of its products. The North’s move came more than two years after an earlier short-lived experiment with commercial advertising. Other products, including ginseng and quail, soon appeared in television advertisements, fueling speculation the isolated country may start to embrace a capitalist mode of life. However, the commercials disappeared a month later when then-leader Kim Jong-il sacked his television point man in anger over what he described as aping China’s early reforms. China has repeatedly pressed the North to follow in its footsteps in embracing reform similar to that which lifted millions of Chinese out of poverty and helped Beijing’s rise to become the world’s second-largest economy. 1. Here is a link to the infamous Taedonggang Beer Commercial and a longer ten-minute infomercial. Here is the ginseng advert. Here is the quail advert. Yonhap reported that Kim Jong-il was unhappy with these ads. 2. 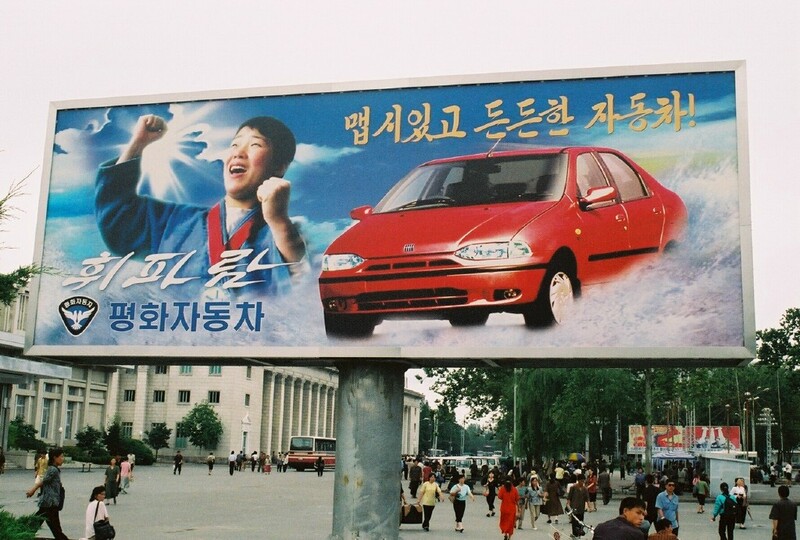 The only commercial billboards that appear in Pyongyang are those for the Phyonghwa Motors vehicles produced domestically by a joint venture deal with the Unification Church. See one of these billboards here. 3. There is apparently a Korea Advertising Company. The recently obtained academic journal called on readers to broaden the “savings battle” in an article titled, “Strongly Spreading the Battle for Savings Is an Important Measure for the Construction of an Economically Strong Socialist Nation.” The article stressed that the “savings battle” was necessary for the successful completion of large-scale industrial construction projects, such as the Huicheon Power Plant, as well as the construction of hundreds of thousands of private homes and pubic facilities. North Korean authorities consider these projects essential to the successful construction of a ‘strong and prosperous nation’ by 2012, the year marking the 100th anniversary of the birth of the late Kim Il Sung. The journal accused the United States of “villainously daring to carry out military pillaging and economic sanctioning measures” in order to blockade the North and reported that “American and Japanese Imperialists are not only sanctioning imported and exported goods, but are going as far as to interfere with loan accounts.” These statements may provide some insight into the economic and social difficulties the international sanctions are causing for North Korea. You are currently browsing the archives for the Economic Research Journal category.